Brayden Child Summary: 8 Years Old! Brayden is now 8 years old! That means we enter a whole new BW book: On Becoming Pre-Teen Wise. Can you believe it?!? I guess that means his next summary will be in a new category–Pre-teen Summary! Ack! Brayden seems to be going through a growth spurt right now. He is eating a lot more at meals. Sleeping has been great. We now let him read for about 10 minutes in his bed before he goes to sleep. We make sure he is in bed early enough that he can add ten minutes. We started this at the time change because he was having a hard time going to bed an hour early. It is something Jim Trelease talks about in his book The Read Aloud Handbook that I have wanted to implement someday. Brayden is old enough and responsible enough to handle it. He is good about watching his clock and reading for the amount of time we tell him and then go to bed. Brayden continues to take swimming lessons. 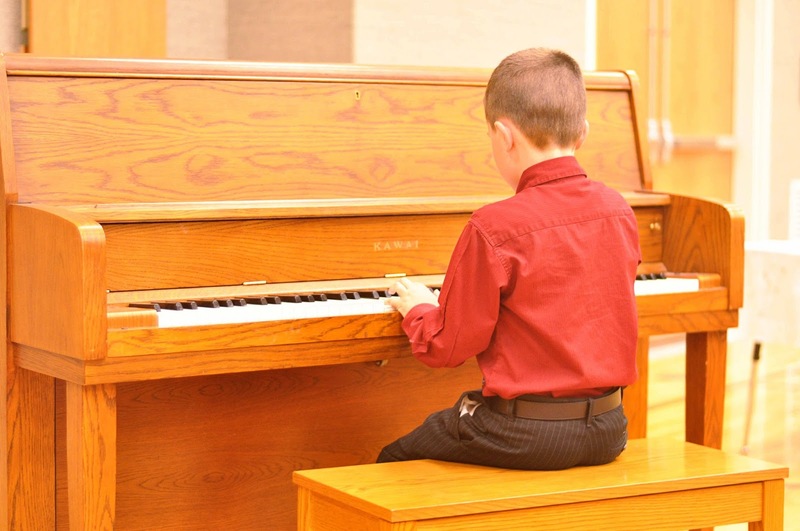 During this last three month span, he also did piano lessons, soccer, and started baseball. Last time, I talked about how it is hard to get Brayden to talk. You may have seen my post last Friday about a book I read, Raising Cain, to help get ideas. We have had good improvements in the talking department. Something right now that is helpful is we play catch every day when he gets home from school. It has worked out well and it is good to have that carved out and planned one-on-one time with him. I think that is the trick for him is one-on-one time, which obviously is harder to come by with four kids and him in school all day. I am learning as I go with him–the perks of being the oldest child right? I will make sure I always have a planned one-on-one activity with him each day. I have a friend who is a mom to one of Brayden’s best friends. She was telling me the other day how when this boy gets embarrassed, he gets angry and she had realized this relatively recently. I have since noticed what Brayden does when he is uncomfortable or embarrassed he makes light of the situation. He doesn’t do this in a witty, make everyone laugh way. He does it more in a “I am too smart and too good for this” way. It is the way he deals with his emotion. This is something we will be working with him on. An interesting thing in the Raising Cain book is the authors talk about how boys tend to have a narrower vocabulary for emotions. Boys and girls of the same age do not identify the same amount of emotions. While girls can name a range of complex emotions, boys simplify and group emotions into a few main categories. So helping boys identify these emotions is important to helping him express them appropriately. An example of this happening was at baseball practice. Brayden feels like if he is corrected, he is somehow bad at it (a perfectionist thing). So at practice one day, there were lots of older boys there helping the younger ones learn how to play the different positions. He started getting really silly and reacting to an instruction of “move to the left a little bit” by either moving an inch or ten feet. It is the end of second grade! He has loved school and continues to do well. It is a little scary to move into older grades. Second grade is still pretty much sunshine and roses and everyone is friends. From my memory and current observations, that starts to change in fourth grade. 7 AM–get up. Eat breakfast. Get ready for school. Practice piano. Play until time to go to school. Play catch then do Homework. 7:00 Chores and start getting ready for bed. 8-8:30–in bed (why does it take so long? We spend a lot of time reading before bedtime. We read scriptures then read chapter books). McKenna Child Summary: 8 Years Old! Next Post Brayden is Baptized! Wowza, I can't belive he is in a preteen category!! That boggles my mind! I guess i always thought of tweens more like 10-12ish range and i would have plenty of time away! I guess i'll need to buy a new book the next year and a half, ack! I swear it just goes by too quickly! !I am curious how much homework Brayden has day in 2nd grade. I am sure this varies in your school district but just curious. Here we thankfully haven't had any in kindergarten but she does optional enrichment packets over the weekend for the kids…i am sure at some point we'll have some homework. Hopefully nothing too long as i don't recall much til older. My oldest will be in 1st grade this fall. Here they have K-2 in a bldg and then 3-4 in another so i agree that i bet 3rd grade will be a whole different ballgame for them! Hi Michael and Yvonne. My son who is 5 and is also an advanced reader really likes the Magic Tree House books. I know Val mentioned that Brayden liked those as well. There's also a post on her blog somewhere that lists what books Brayden has read but I can't seem to find it! Thank you Janelle for that link! interesting i was at the library used book sale this AM and a mom was talking about Junie B Jones…….she said it's mixed reviews and the girl is kind of naughty and uses bad grammar but it's really funny. so i'm curious as Val said in the link she didn't like it………was it for attitude/tone? Grammar? I saw the Magic Tree House there and looked at books 1-3 backcovers…so this will sound really silly but i think she'd be scared! One was about dinosaurs and if they'll get eaten for dinner, one about mummies,etc….she is a fraidy cat who doesn't watch anything scary. I know it's pure imagination but i think if she read that she might have bad dreams? I should probably read one to see what it's really like and maybe it's mild. Kay I am going to take these one at a time–homework in second grade–he actually had less than he did in first. I think that will vary from school to school, teacher to teacher, and district to district. For example, Brayden's teacher (bless her) didn't send home homework on holidays (even Halloween) or usually on Fridays. Another second grade teacher did every day of the week, every day of the year. He spent usually about 10-15 minutes a day on homework. I then checked it. I also practiced spelling with him usually daily. And then they have the required homework to read 20 minutes a day, but that is already a part of our normal routine (we read much more than that) each night before bed.Kaitlyn did have homework in Kindergarten. Hers was a situation where they got homework Monday and turned it in Friday. Hers wasn't difficult, but she is a good reader so I think a child who couldn't read well would have a harder time. books–I was thinking I need to do a book post for chapter books. For Kaitlyn, she will have a very different interest in books than Brayden. She isn't into Harry Potter and How to Train your Dragon and such like he was/is.I found a series of "Treasury of Illustrated Classics" that I like. We have read A Little Princess and are now reading The Secret Garden. You might check those out. Junie B. Jones–she has a bad attitude! And I don't like that because I think you pick up on the tone of the book when you read. I know I do. If I am reading a book where the main character is moody, I feel moody. So I think for a young child, she is not the example of what I want my kids reading. I am not so concerned with grammar–we basically live in the country and my kids are surrounded by it and they still speak correctly, so I know I am the biggest impact on their grammar. Thank you for your responses! And i'd love a book post for chapter books…….I bet she will be like Kaitlyn and have a distinct tilt towards more girly stuff.interesting about Junie B Jones….i get what you are saying and I definitely watch what TV shows they watch with that. But a lot of girls characters have attitude….Pinkalicious does. And I the Beverly Cleary books about Ramona, i think she was a bit of a troublemaker. I can't recall as that was when i was a girl. But it seems like some of the girls are kind of precocious and have attitude. So it is something to consider but on the other hand i don't know to what extent as the Pinkalicious books are pretty funny. I guess it if has a moral and shows good things you can discuss how we don't act a certain way or what the character has learned? But i know when mine were little I specifically didn't read books about kids fighting and hiding instead of going to bed as I didn't even want them to get that seed in their head! So i think maybe they can get ideas and think they are being funny,etc. But what was so interesting is on that guest post you specifically cited Junie B Jones and the Smelly Bus and it was on Jim Trelease favorite books for kindergarteners, lol. So obviously everyone has different criteria. I definitely see your point and I want to be careful what to expose to as I don't want to create issues….but if it is so over-the-top maybe it can be a learning thing how not to act? We'll see. There is so much out there i have no clue about as they didn't have when i was a girl. I recently found Fancy Nancy. I also saw the Magic School Bus series,etc. I guess i will be looking at a lot over the summer. I'm not sure if we will start on series yet anyways. I guess the kids start to read chapter books in school around grade 2 i think….don't want to rush them ahead as there are some great picture books still for higher levels. Anyways thanks so much for your thoughts! Lots to think about. Brayden started chapter books in Kindergarten, but Kaitlyn has preferred to stay in picture books. She will read chapter books with me, but prefers picture. I think it is indicative of their personalities; she LOVES art and she loves looking at the pictures in books. Brayden doesn't care so much about pictures. You are right about girls and attitude in books! There are books that have good girl heroines. I think Junie B. Jones can be okay at some point–and different kids probably can handle it at different ages. Remember my post about the wall-of-water anaology and protecting children? The question is at what point can your child handle reading that attitude and still maintain the morals she knows are right? Brayden read some Junie B. Jones during his free reading this year during school and he was fine. He is old enough he can clearly recognize that as A) a a story and B) not okay. Another series that has similar things I don't like that people do like is Adam-Joshua Capers. He is always fighting and angry. I think there are things kids can read in books that they never would have thought to do on their own.